6.3 % of the personal members live abroad. The portion of women is 15.9 %. The median of the age of the members is 34 years, the average 37,5 years. 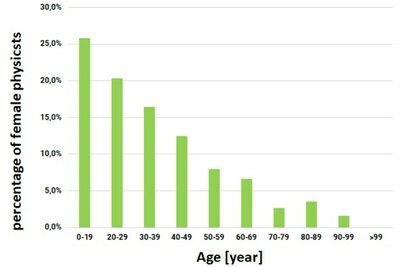 In the chart, the age structure of DPG is shown. Because of the relatively low number of DPG members below 10 years service, the cohorts between 0-9 and 10-19 years are summed up. The share of male members is depicted in blue, whereas the female share is in green. Most DPG members are younger than 40 years old. In this segment, the share of female physicists is much higher than the total average. The diagram shows the percentage of female physicists within DPG per cohort. Because of the relatively low number of DPG members below 10 years service, the cohorts 0-9 and 10-19 years are summed up. As expected, the percentage of female members decreases with increasing age. The female share within the group of members being less than 20 years old constitutes more than 25 percent, which exceeds the female share of physics first-year students. The graph represents the development of the female share within DPG over time since 1982. 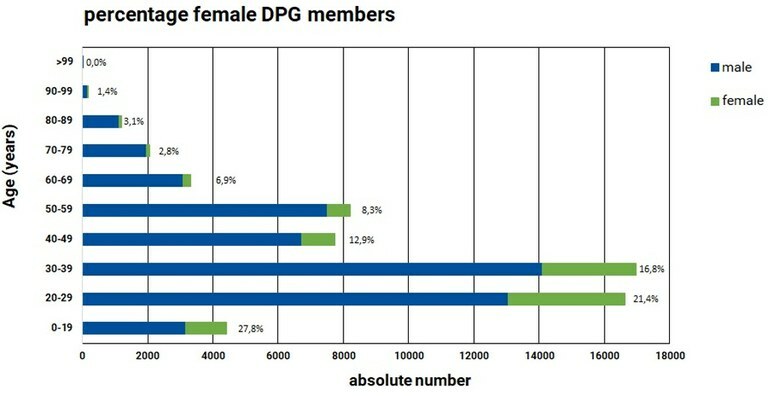 While the percentage of female DPG members was in the range of just a few percent previously, the current share amounts to 15 percent due to constant growth. The erratic increase of more than 2 percent in the year 2001 correlates to the initiation of the DPG High School Prize. 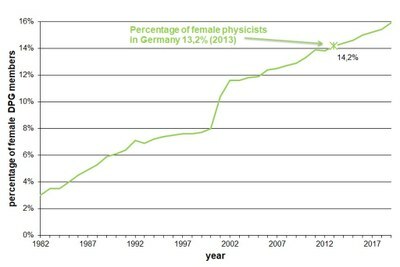 In 2013, the percentage of female physicists within DPG exceeded the percentage of female physicists in Germany for the first time (according to the Mikrozensus).